Have you ever wanted to create fine detail in a polymer clay piece but didn’t have the right tools? Toothpicks will work in a pinch, but they only come in one size and the wood can be quite rough. 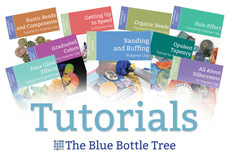 Tutorials and lessons often suggest using a “needle tool” for sculpting clay, creating faux embroidery, or making bead holes in unbaked polymer clay. But where do you find a needle tool? Needle tools are often used with earthenware and metal clays and so you can usually find them in the sculpting section at a craft store. I think this metal-handled needle tool from Metal Clay Supply is quite nice. But it only comes in one size and I prefer to have needle tools in different sizes. Have you ever thought to make your own needle tools? Here’s how to make an entire set. Yarn needles and needlepoint needles have a blunt tip and a large eye. Other names for these are darning needles and tapestry needles. You can also use chenille needles, which have a large eye and a sharp tip. I bought these at WalMart for a couple of dollars per package. I’ve chosen to make needle tools in a range of sizes. Note that the needle on the far right has a sharp point. Cut a piece of craft wire and insert it into the eye of the needle. While holding the needle with the pliers, begin to wrap the wire loosely around the eye of the needle. Wrapping the eye like this keeps the needle from turning in the handle of the needle tool and gives it more stability. Don’t worry how neatly you wrap. Loose and sloppy is better as it gives more grip. Wrap the eyes of all your needles with wire. Note that I used a thicker craft wire for the largest needle. Take a lump of clay and form it around the eye end of the needle, shaping the clay as desired to form a handle. You might want a short thick handle or a long, pencil-like one. Take care to snug the clay around the needle to ensure a good hold. Bake all of your needle tools at the recommended temperature for 1 hour. The longer bake time ensures a stronger clay handle. Needle tools are part of my Indispensable Tool Series, an ongoing series of tools and materials that I find to be completely indispensable in my polymer clay studio. These needle tools are made in a similar way as my Natasha Bead Hand Drill Tools, so you might want to consider making a full set of color-coordinated hand tools for working with polymer clay. You could use the Natasha Bead pattern as I have done here, or you could decorate and embellish the tools any way you would like. I like the idea of using ugly old clay and then covering the handles with slices of intricate and beautiful kaleidoscope canes. Perhaps even make a set in colors to match your studio or your business’s branding. The choice is yours. Have you ever made your own tools for working with polymer clay? Did you make your own needle tools? If so, I’d love to hear about it in comments. Pictures and links are welcome, too! Very clever tools, I’ve been wondering what I could use to make some large round holes in clay. So far I haven’t seen any cookie cutters small enough for what I want. I agree with Finola (comment below). Drinking straws are my go-to tool for that. Sometimes you can even find fine gauge metal tubing that works beautifully. Check a hobby store, like the kind that sells radio controlled planes and such. Hello, when you use the straws as hole punch how do you get the clay out of the straw? Just use another, smaller straw. Or use a wooden bamboo skewer. Great Tut Ginger, thank you for sharing. They certainly look better than the tooth picks I’m using at the moment. Oh, yes, much better than toothpicks! Dolores – have you thought of using drinking straws or the inside tube of all pens or handcream pumps? I’ve not tried cold porcelain. I wonder if it would be too brittle? It doesn’t take a whole lot of clay. I used just under 1 package total for all of these. And thank you for the suggestions for Dolores. I’d not thought of handcream pumps. Great idea! I’ll try the cold porcelain and let you know – I am thinking that when it gets thick, smooth crack-free drying can be a challenge,.. Probably true. Hmm. But worth a try, certainly. Me too! It’s a very sharp needles and it’s for popping bubbles in resin and sealers. And these would work for all sorts of other crafts, too. There are lots of shapes you could embed into a clay handle to make a tool. Thanks for the tips Ginger and Finola. I was looking for something a little bigger than straws but like the idea of using metal pipe. Think I will shop the plumbing section the next time I go into town. Thanks again. I have a few of them from many years ago but no circles. I’ll check them out, thanks for the link. Thanks for the info. The explosion of the fondant and cake decorating craze has given us many more tools to use in polymer clay and that’s a great thing. Hobby shops have small diameter ‘pipes’ for making miniatures. I believe in several sizes. And check straws that are given with thick milkshakes and ‘frosty’ type drinks. I have gotten straws larger in diameter than my smallest Kemper cutter! The – bad- part is you might have to go to several different ice cream drive-in’s and have several different frosty’s. Sorry ’bout that. I’ l’ll do that part for you if you wish…. thanks for sharing this tutorial Ginger..
Ginger. If you are looking forever smaller shapes than what kemper makes I have them! The Clay Punch! Started the line over 8 years ago for metal clatters but found that pc people love them to! Check them out on my site. http://Www.naturescapesstudio.com. Or my etsy shop – superfluityshop ! Thanks for a great site and all the good information! You asked about what other tools we might have made…. Well, i am a crocheter, and have lots of those tiny little steel crochet hooks. The older i get, the harder they are to hold for any length of time. So, i made handles from polymer clay. The first one I tested was too heavy, and made my hand/arm tired (I can crochet for hours! ), so I used Sculpey Ultralight for the largest portion of clay to lighten the whole thing, and that worked just fine. I am new to polymer clay, and I have a lousy oven, so the first batch burned to a crisp. Well, actually, to a kind of mush. Brown, smelly, ick! So I tried again, and they came out great. I am very sensitive to the energy of objects I hold/work with, and let me tell you, it feels great to be crocheting with these beautiful objects I made myself. What a great idea! I’ve never tried the ultralight. Sounds like a very good use for it. And yes, things made yourself certainly do have a wonderful energy. So fun to read this creative gaggle of women sharing with each other! Making tools for polymer clay is a creative process itself. I must admit though, that I am lazy and for most details on my clay (at least so far) I use nail care tools that I have dedicated to PC. I made some lovely miniature roses with them. They are not the most easy to use tools, but hey, improvising goes a long way! I am new to PC. Made my very 1st piece TODAY — a small 2 shades of blue (sure there is a technical name for this process) daisy, placed on a tiny clothes pin, to be used as a fridge magnet! My instructor (old classmate, scrabble buddy, and all around great gal! ), said she was really impressed!! Think my head swelled 2 sizes! Can’t wait to start new project!!! Yay! Welcome to this wonderful medium. It’s great fun and you’re going to love it!